Phil was born in Suffern, New York, and grew up there with his father, Donald Matthew Murphy, his mother, Joan Glynn Murphy, his sister Catherine M. Boling, and his brother Don Murphy Jr.
Airplanes always fascinated Phil. When he was a small child he would always remark “AIRPLANE!! !” whenever a plane flew overhead. On weekends, when he was 3-4 years old, we would go to the small local airport and eat a picnic lunch while we watched the planes take off & land. He often told me that he was going to be an airplane pilot when he grew up. By the time he was a sophomore in high school we finally believed him. Phil graduated from Embry Riddle University in 1981 with a degree in Aeronautical Science. He then entered the United States Navy and flew S-3 Viking aircraft as a Carrier pilot while attached to VS-32 and VS-41 squadrons while on active duty. 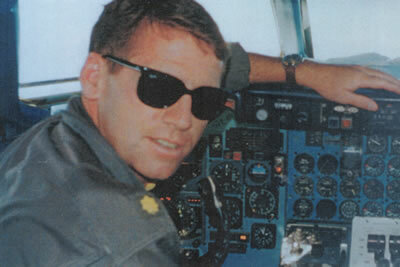 As a U. S. Naval Reservist, Phil flew the C-9B with VR-57. Phil became an Alaska Airlines pilot in 1992 and flew the McDonnell Douglas MD-80. Phil and his wife Anne were joyously married on April 13, 1985 and more joy came into their lives with the births of their son, Philip on June 2, 1990 and daughter, Elizabeth on March 23, 1993. Phil brought joy, laughter, and meaning into every life that he touched.